Q: The US Senate has approved the nomination of Terry Branstad as ambassador to China. What expectations does China have for the new ambassador? A: Over the years, Mr. Terry Branstad has made positive contribution to promoting the communication and cooperation between Chinese and US localities. We hope Mr. Branstad will, after his assumption of office, play a more positive role in enhancing the exchange and understanding between the two peoples and promoting the sound and steady development of China-US relations. Q:It is reported that the Geneva peace talks on Syria concluded on 19 May. What is your comment? How do you think of the prospect for the Syrian issue? A: The sixth round of Geneva peace talks ended on 19 May. With the mediation of the UN Special Envoy for Syria Staffan de Mistura, the Syrian government and the opposition exchanged views on the established agenda, and held a technical experts' meeting on the enacting of constitution in particular. The dialogue maintained the momentum of implementing UNSC Resolution 2254 and politically resolving the Syrian issue through dialogue mechanism. China appreciates the effort of the UN and Special Envoy Staffan de Mistura in particular. We hope relevant parties of Syria can seize the opportunity to push for new substantial progress by making full use of the platform of Astana dialogue and Geneva peace talks. Through a "Syrian-led and Syrian-owned" political dialogue, they should continue to build mutual political trust and work in the same direction to find a solution that accommodates the rational concerns of all parties. The Special Envoy of the Chinese Government on the Syrian Issue Xie Xiaoyan attended the relevant activities in Geneva, extensively contacted with the Syrian government, the representatives of the opposition, Russia and Turkey and made great efforts for peace talks. 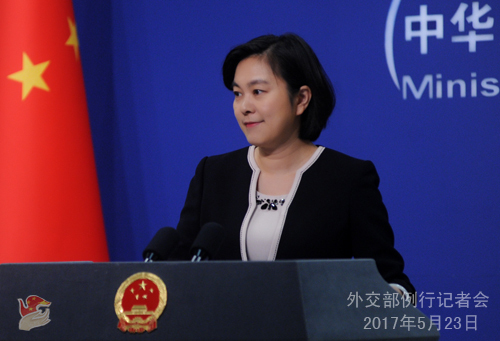 China wishes to work with the international community to play a positive and constructive role in promoting an early comprehensive political solution of the Syrian issue. Q: The Taiwan "Mainland Affairs Council Chairperson" Zhang Xiaoyue claimed on 22 May that some countries were forced by China to sign an agreement on joining the Belt and Road Initiative under the one-China principle in exchange of low-interest loans. The Council also stated that the mainland tried to pressurize Taiwan by publicizing the one-China principle in the Joint Communique issued by the Belt and Road Forum for International Cooperation. What is your response? A: It seems that certain people on the Taiwanese side are so worried that they even talked nonsense like that. As is known to all, the one-China principle is a universal consensus among the international community. There is but one China in the world and Taiwan is part of China. Since it was proposed four years ago, the Belt and Road Initiative received positive support from and was joined by over 100 countries and international organizations. The content of the initiative has also been included in major resolutions of the UN assembly and the UN Security Council. Recently, the United Nations Economic and Social Commission For Asia and the Pacific has also adopted a resolution in support of the Belt and Road Initiative. Last week, over 130 countries and over 70 international organizations sent representatives to the Belt and Road Forum for International Cooperation. The participants speak highly of the Belt and Road Initiative and hope to jointly promote the building of the Belt and Road Initiative and share development opportunities and outcomes. This has proven that the Belt and Road Initiative conforms to the trend of the times and the law of development, serves the interests of people of various countries and enjoys broad and bright prospect. I would like to advise the relevant people to open their eyes and have a look at the world and do not let their vision be blocked by narrow political interests or ideological bias. 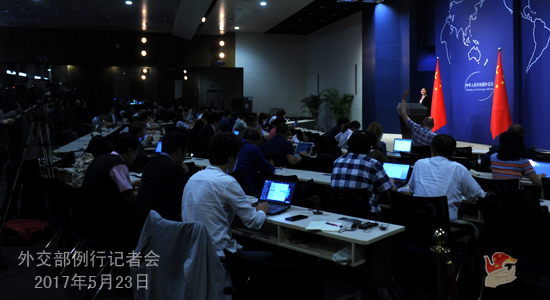 Q；The WHA has rejected the Taiwan-related proposal, leaving the issue off its supplementary agenda. What is your comment? A: The 70th session of the WHA has rejected, on the basis of consensus, the inclusion of the so-called proposal to "offer Taiwan permanent observer status" into the agenda. This decision defends the dignity of the relevant UN Assembly and WHA resolutions and fully demonstrates that the one-China principle is the shared aspiration and the irresistible trend of the international community, and China welcomes that. 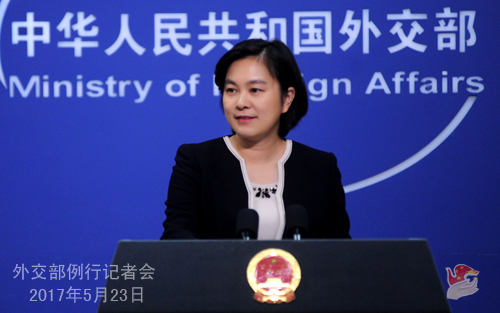 I would like to reaffirm that the central Chinese government wishes to properly handle the issue of Taiwan's participation in international organizations' activities through cross-straits consultation and in accordance with one-China principle. Q: According to the BBC, casualties have been caused in an explosion at a stadium in Manchester on the night of 22 May. The Manchester police is yet to specify the number of casualties as the investigation is under way. What is China's comment? A: China is deeply shocked and saddened by the explosion in Manchester. We deeply mourn the innocent victims and express our sincere condolence to the injured and the family of the victims. President Xi Jinping, Premier Li Keqiang and Foreign Minister Wang Yi have sent message of condolence to the British side. Q: Last month, the amount of goods that China imported from the DPRK fell below 100 million dollars. Does this figure show China's commitment to enforcing sanctions? Does this send a message to the US that China is taking measures to put pressure on the DPRK and it is taking further actions against the DPRK because of its nuclear and missile programs? A: China has always fully and strictly implemented the relevant UNSC resolutions in their entirety. At the same time, we keep normal economic and trade relations with the DPRK and other parties on the prerequisite of not violating the resolutions. Q: Several Chinese tour groups halted visits to the ROK in March in response to the THAAD deployment. Do you have any comments on whether these tours are now resumed? A: I am not aware of what you said. We remain positive and open to normal people-to-people exchange. We also believe parities should create enabling atmosphere and conditions for normal people-to-people exchange between countries. Q: Last week, President of the Asian Infrastructure Investment Bank (AIIB) said that the AIIB is expected to expand its members up to 85 by the end of year. Can you comment on it as the bank financing is very vital to addressing infrastructure needs across Asia? A: The Asian Infrastructure Investment Bank (AIIB) is an open and inclusive multilateral development institution which admits new members under the Articles of Agreement of the Asian Infrastructure Investment Bank. As the initiator of the AIIB, China is pleased to see the growth of the AIIB and hopes it will play a bigger role in boosting global economic recovery, promoting regional infrastructure construction and connectivity and enhancing the common development of regional countries so as to benefit more countries. Q: It is reported that the ROK President Moon Jae-in will adopt policies seeking dialogue with the DPRK, which includes as long as the framework of sanctions against the DPRK is not undermined, the ROK and the DPRK can resume personnel, social, cultural and sports communication. The ROK will also stay committed to providing humanitarian assistance to the DPRK. What is China's comment? A: We have noted the positive message sent by the new ROK administration in their DPRK policy. China has always supported the ROK and DPRK in strengthening friendly engagement, enhancing communication, improving bilateral relations and promoting reconciliation and cooperation.